There have been many significant changes in the influencer marketing industry within just a short period of time. And whether you’re a marketer or an influencer, it’s wise to stay updated with these changes and updates. This can help you execute more effective campaigns or better monetize your influence. According to a study conducted by Klear, there was a 198% growth in influencer marketing during 2017. The company conducted their study by identifying all Instagram posts tagged with the hashtag #ad during the years 2016 and 2017. In addition to this significant annual growth, the average month-over-month growth was 5%. Influencer marketing is making tectonic changes in the world of marketing. Brands are increasingly shifting their focus from outbound marketing to influencer marketing because of its effectiveness. This is evident from its growth. The same Klear study also found that there were a lot more women creating those #ad posts during 2017. 83.7% of the posts were created by women. Pair that with the results of a comScore study that showed that 58% of users on Instagram are women. And you can see why this seems to be an industry dominated by women. Linqia conducted a study of 181 marketers on their usage of influencer marketing. 92% of marketers that claimed to be using influencer marketing found it to be an effective strategy. Considering the effectiveness of their existing influencer campaigns, a number of them expected a change in their budgets. According to the study, 39% of marketers say that they would be increasing their influencer marketing budgets for 2018. 35% of marketers in the study were still unsure about how they will change their influencer marketing budgets. 21% said that their budgets would remain the same, and only 5% said that their budget would decrease. Aside from influencer marketing budgets, it seems like marketers are also making changes in the types of influencers they’re leveraging. Instead of creating campaigns with a single influencer type, an increasing number of marketers are opting for campaigns that leverage different types of influencers such as micro-influencers, celebrities, and top-tier influencers. In fact, the Linqia study cited earlier found that 52% of marketers will be adopting the trend of an integrated campaign with multiple influencer types. The second most popular trend involves the usage of influencer-created content for optimizing a brand’s performance on other digital channels. The latter half of 2017 saw numerous brands that prefered a cross-channel approach to influencer marketing. This will likely continue to be a trend in 2018, especially for brands having a bigger warchest at their disposal. There are numerous influencers who have are respected and sought after on more than one channel. They are just as quick to share a video on YouTube as they are to post a photo on Instagram or send out a Tweet on Twitter. By identifying the right individuals, brands can benefit from an omni-channel influencer marketing campaign. One that includes boasts various kinds of influencers and content. The metrics used for measuring influencer marketing campaigns may vary for different businesses and campaigns. However, the Linqia study found that 90% of marketers measure the success of their influencer marketing campaigns through engagement rates. After engagement, click rate is another popular performance metric. 59% of marketers in the study said that they measure campaign success based on the number of clicks an influencer can drive. Other important performance metrics include impressions, conversions, reach, and product sales. 2017 saw a shift away from surface level metrics like reach because they’re not easy to measure organically. As was evident from the 11% drop from the previous year in marketers using reach to define influencer campaign success. Instead, they’re reliant on metrics like product sales, which have seen a 34% hike since 2016. Marketers have been leveraging influencer-created content by repurposing it for other channels. 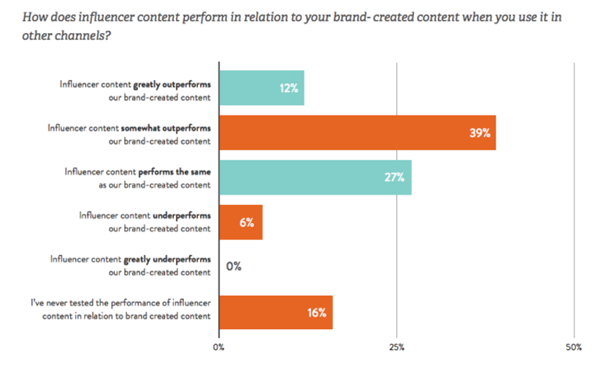 And according to the same Linqia study, this influencer content outperforms the brand-created content. According to the study, 81% of marketers are currently using influencer content on other channels. 51% of them said it outperforms brand-generated content. Of those who haven’t tested the two against each other, almost a sixth of them intend to do so in 2018. In addition to that, 44% of marketers are planning to use influencer marketing to improve their performance on other channels. While a little over a third of them will attempt to drive product sales by integrating influencer content with ecommerce. Overall, 39% of marketers in the study said that influencer content somewhat outperforms their brand-created content. 12% said that influencer content greatly outperforms their brand-created content. We see an increasing number of brands adopting influencer marketing. Perhaps that’s because it performs much better than other marketing channels. A WHOSAY study found that influencer marketing has more than twice the industry average engagement rate compared to other advertising and media channels. On Facebook, influencer marketing drives three times more video view-through rates compared to other marketing channels. This isn’t to say that brands should completely ignore traditional media channels. Rather they should consider integrating both in their marketing strategy to get the best of both worlds. Brands are finding it increasingly difficult to engage consumers using traditional promotional means. This is primarily because consumers trust word-of-mouth marketing over other forms. In fact, 25% of internet users are employing some form of ad blocking to tackle pushy marketing content. On the other hand, influencer marketing is helping brands get their message across with more creativity and authenticity. 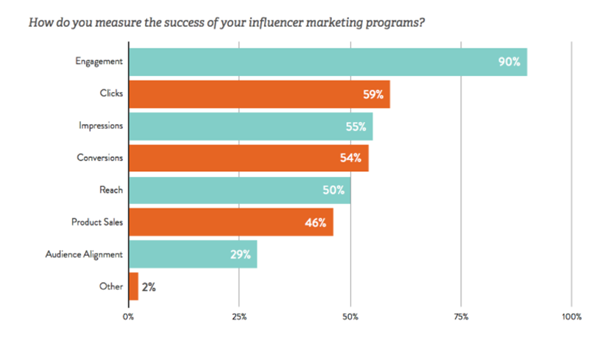 Influencer marketing has been known to drive engagement and improve brand reach. But it can also influence how people feel about a brand. It has been able to drive more than 70% positive sentiment scores according to the WHOSAY study. You’ve probably noticed how fashion and cosmetics brands have been leveraging influencers. But do you know the actual statistics behind their influencer marketing use? According to a Launchmetrics study, almost 80% of these brands executed an influencer marketing campaign during 2017. 89.6% of the FLC experts who used influencer campaigns found it to be effective in spreading brand awareness. Roughly 73% claimed it helped build brand loyalty among consumers, and 69% found it effective in driving their sales. Given these numbers, it’s imperative then that you as a FLC brand nail your influencer campaigns if you wish to edge out your competition. It goes without saying that brands are likely trying to reach millennials through influencer marketing. But there haven’t been actual studies to prove this theory until the Launchmetrics study. 76.4% of marketers surveyed said that they’re mainly targeting millennials, followed by generation X, and then generation Z. This ties in with a study conducted by Bain & Co. which found that 30% of all luxury spending is being done by generation X. Together with generation Z, they account for 85% of the growth in the luxury industry in the past year. Micro-influencers seem to be a favorite among brands. According to the Launchmetrics study, 46% of brands prefer to work with micro-influencers with 10,000 to 100,000 followers. After this comes macro-influencers with 101,000 to 500,000 followers. 33.6% of marketers surveyed said that they prefer working with them. Among all the social media platforms available, Instagram seems to be a favorite among influencers. 91.9% of influencers in a Hashoff survey voted it as their number one platform for monetizing their influence in 2017. Facebook and YouTube came in second but they each received only 2.7% votes. 87.1% of influencers in the survey still chose Instagram as their number one platform for 2018. 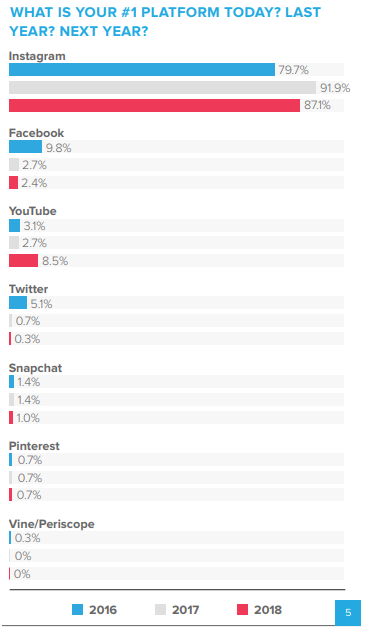 YouTube came second with 8.5% of influencers voting for it, followed by Facebook with 2.4% votes. It’s not just influencers who are in love with Instagram for executing influencer marketing campaigns; brands love it too. 92% of marketers in the Linqia study said that it’s the most important social media channel for working with influencers. Facebook comes next with 77% of marketers voting for the platform. Clearly then, it’s imperative that you grow your presence on platforms like Instagram and Facebook. Regardless of whether you’re a brand or an influencer, you need a credible presence where your target audience is. According to the previously-cited Linqia study, 76% of marketers said that their biggest challenge with influencer marketing is in determining ROI. But in addition to this, there is a big new challenge marketers are facing after Facebook’s move into branded content. 42% of marketers in the survey said that their second biggest challenge during 2018 would be the changes in social media algorithms. These are 14 interesting stats about influencer marketing that you should know about to execute more effective influencer marketing campaigns this year. Got any questions about these points or any thoughts you’d like to talk about? Feel free to leave a comment below.